Thanks, Denis! Glad you enjoyed. Have a terrific weekend! What a beautiful, soulful gaze. Enjoy your weekend Laura! Thanks so much Tori. You too! Lots to celebrate at your place! Charlie is definitely a cutie! Oh Laura – when I saw this drawing, my eyes welled up – with joy, with gratitude, with love, and then with laughter – remembering that rib fest day! You captured my sweet Charlie’s sweet soul, and I am blown away! I cannot express in words how happy you have made me this morning. Thank you sweet sweet Laura! Charlie and I love ya! I more than enjoyed. It touched me deeply – and I did need it after a long week! Thank you for thinking of me. Hugs! You capture the love and gratitude in his sweet eyes. I think all the comments above cover the joy in your drawing today Laura. And, Charlie’s the very best subject. I do love pencil sketches. Happy day ahead with your yummy treats. Thanks, Sharon! :))))) The humble pencil is a good friend. Thanks so much, Laura! So glad you enjoyed it! Lovely – think we’re all stirring stew of one sort or another…. tis the season! Thx, Nexi! Wonderful drawing of a gorgeous dog (and that stew sounds delicious! ). Come on over, Michael! 😀 Thanks for your kind comment. Aw, thanks Jill! 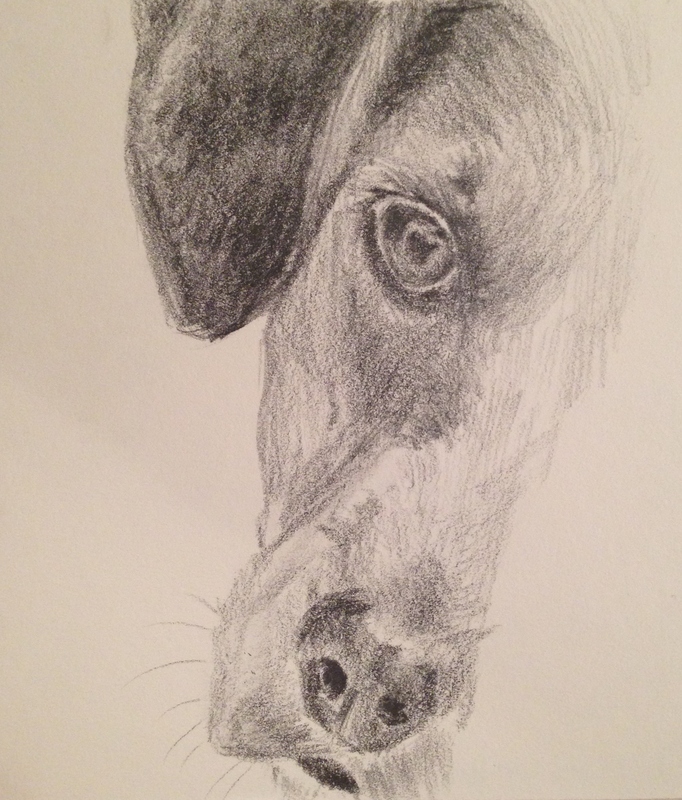 Foreshortened snouts are tricky. I feel like I’m making progress though. Glad you like it! Charlie is precious – wonderful drawing Laura! Thanks so much, Mary – enjoy your weekend! Thanks so much, Debi! I really appreciate your encouragement! I do love the partial face composition. Wonderful sketch! Enjoy the rest of the weekend. Thanks so much, Catherine! You too! Glad you couldn’t resist! Adorable. Thanks, Susan! Wonderful dog and photo! I love dogs, your drawings make me realize how much I miss having one in my family. I am going to draw some dogs in my coming sketches now! I love how soft your lines are, it creates a very gentle atmosphere around your subjects. Nice going!